Even though some form of a tighter fiscal integration in the euro-zone is still in the works, here is the latest idea being bounced around in Europe to address the crisis immediately. 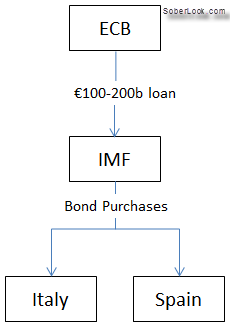 This structure is supposedly going to get around the rules that make it hard for the ECB to buy paper directly. Bond purchases may include new issue or even focus entirely on new issue paper or a direct emergency loan to governments. 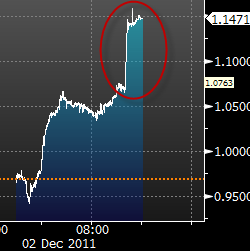 It is in fact a form of QE for the euro. The ECB is not expected to sterilize a loan this size. Germany is going to have a tough time with the idea even if it gets around the ECB restrictions because of their inflation fears. 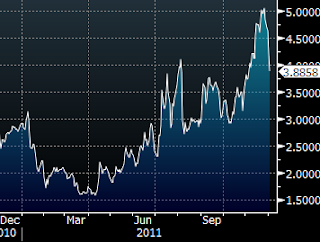 Sovereign spreads are reacting quite positively to this proposal. Below is the 5-year Spain bond spread to Germany. Later in the day (as expected) we saw resistance to this proposal from US politicians concerned with the US exposure to IMF. The US has a veto power at the IMF (Germany has been asking the US for a while to give up the veto right) and some politicians want to use this power to stop IMF from taking large sovereign risks (per structure above). The Hill: “I’m adamantly against the IMF being involved in this,” [Sen. Tom Coburn (R-Okla)] said. “We’re throwing good money after bad down a hole that I think is not a solvable problem,” he said. “Europe is going to default eventually, so why would you socialize their profligate spending,” he added. Coburn estimates the U.S. could be liable for as much as $176 billion if the IMF shores up Italy and Spain and the European Union collapses.